Acer has been a member of the Responsible Business Alliance (RBA) (formerly the Electronic Industry Citizenship Coalition, EICC) since 2008, and actively participates in the coalition’s activities and conferences to better understand international trends in corporate social responsibility and share in the practical experience of its members. All Acer suppliers are required to comply with both the RBA Code of Conduct and local regulations. In addition, since 2008 we carried out on-site RBA Code of Conduct supplier audits, gaining a deeper understanding of each location’s working environment and the human rights conditions of the workers. 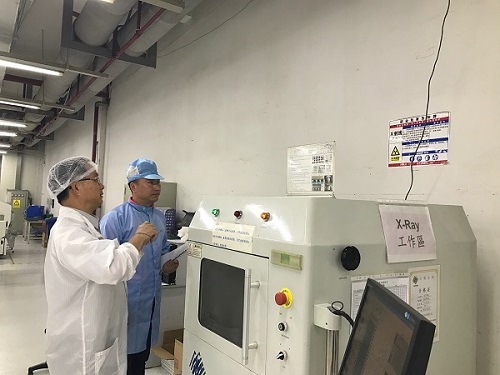 We also encourage tier one suppliers to implement corporate responsibility and advocate for RBA code standards in their own suppliers, thus improving the working environment in the electronics supply chain worldwide. We implement vendor CSR scorecard assessment in order to look at performance in CSR and with regard to the environmental, social, and governance aspects. We continue to communicate with suppliers and enhance their ability to respond to sustainability issues, as well as encouraging suppliers to incorporate sustainable development matters into their management agenda. We continue to hold annual supplier CSR communication meetings, providing the latest in CSR developments and trends, as well as analyzing supply chain issues and potential actions. These meetings also provide an opportunity for two-way communication between Acer’s management and the suppliers, continue strengthening the capability of entire supply chain in terms of environment and social responsibility. 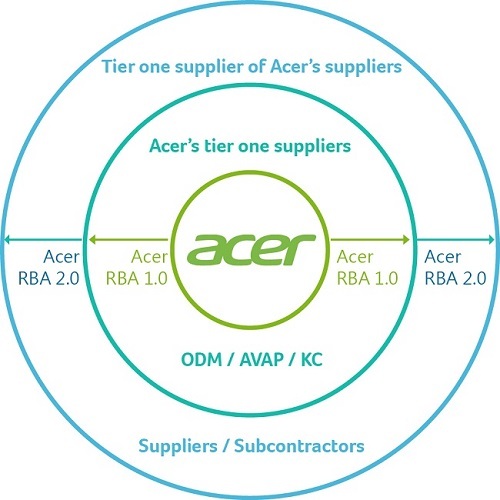 To ensure that Acer’s suppliers clearly convey the RBA Code of Conduct to their own suppliers, and to ensure compliance with that same code in suppliers, from 2016 we require all tier one suppliers to conduct risk assessments of their suppliers. Where risk is found to be relatively high, our suppliers must also undertake review and tracking of improvement measures. We also continue to focus on managing overtime figures for our ODM suppliers and on ensuring all staff receive at least one day off every seven days. To this end, we undertook bimonthly tracking and monitoring, and should any deviations for the targets be found, we shall require the supplier affected to implement an effective solution. We are committed to developing supplier social and environmental management guidelines while also making use of our multifaceted communications channels to provide assistance to those suppliers. 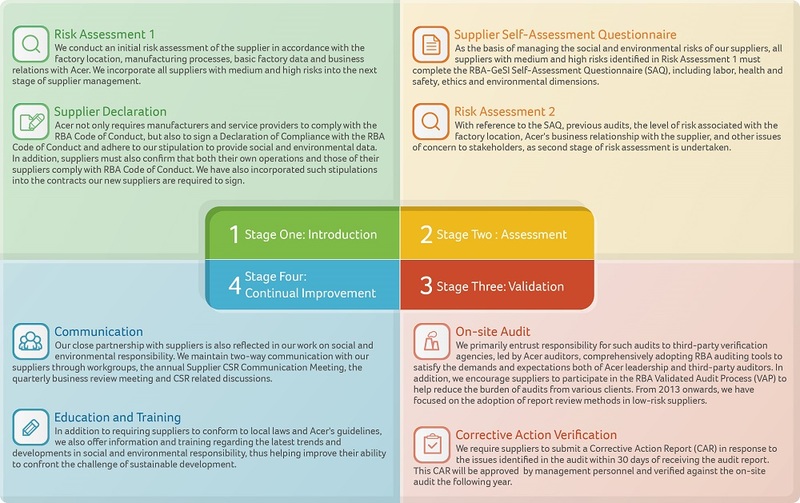 We have adopted the RBA Code of Conduct as our standard and refer to the RBA Supplier Engagement Process by dividing our suppliers' social and environmental management process into four stages: Introduction, Assessment, Validation, and Continuing Improvement. New suppliers must pass the social and environmental responsibility assessment and sign an RBA Code of Conduct compliance declaration before they become official suppliers. Through the aforementioned process, Acer works with suppliers on social and environmental issues to establish a sustainable supply chain. In 2013, we began implementing vendor CSR scorecard assessment in order to look at implementation of and performance in CSR.The results of this scorecard for some product lines and key components were presented at the quarterly business review in early 2014, providing both Acer's own management and the senior management of suppliers with information that will drive improvement on both sides. Overall, in 2017 the performance of all types of suppliers on the vendor CSR scorecard was higher than that in 2016. 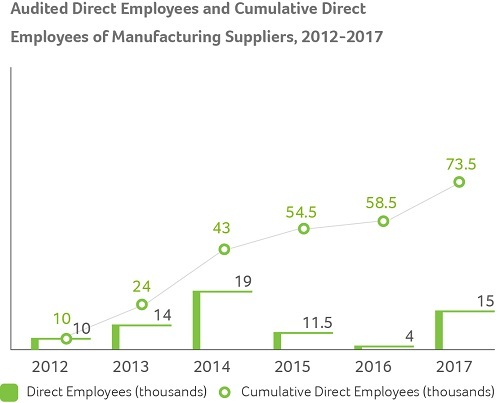 More than 34% of suppliers achieved the level of “excellent,” and nearly 54% of suppliers were at “medium” performance. However, approximately 12% of suppliers still fell into the “rapid improvement” range. We also use quarterly business reviews or individual meetings in order to demand underperforming suppliers implement appropriate actions to improve their CSR performance. We will continue to make use of these mechanisms into the future and will adjust the items for assessment and the distribution of weighting in line with changes in internal and external issues, as well as past performance. In order to put into practice environmental and social responsibility in Acer’s supply chain, since 2016 we have required our suppliers to implement risk assessment and management to their tier one supplier based on the RBA Code of Conduct. For higher risk suppliers, they also have to carry out on-site audits and management of follow-up improvement efforts. We call this “Acer RBA 2.0no1 ” Additionally, we incorporate performance in this regard into our vendor CSR scorecard assessments. 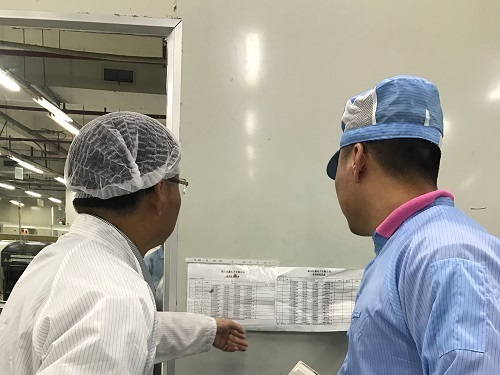 Acer’s suppliers must treat their staff in a respectful manner, using environmentally responsible manufacturing processes and providing safe working conditions. We have adopted the latest version of the RBA Code of Conduct, which covers the five major aspects of labor, health and safety, the environment, ethics, and management system. Acer continually carries out audits of suppliers with regard to both social and environmental responsibility, employing different auditing methods in line with the particularities of each supplier’s operations and their implementation of the RBA Code of Conduct. Through these different auditing methods, we can verify any lapses we may find in the aforementioned five areas require suppliers take corrective steps by a given deadline. Thus we are able to continually improve the social and environmental responsibility of Acer's supply chain. Acer uses the results of risk assessments as the basis for on-site audits. We look at the country risks, production processes, and products produced by our suppliers, and then incorporate issues of stakeholder concern with the results of audits to produce annual audit plans. In 2017, we identified a total of 71 supplier plants as in need of on-site audits. Auditing methods include: audits by Acer supplier management, audits by third parties, RBA Validated Audit Process (VAP) audits, and evaluation audits. We particularly encourage our suppliers to implement the VAP in order to broaden the useful scope of our audit results and improve overall industry responsibility and compliance. 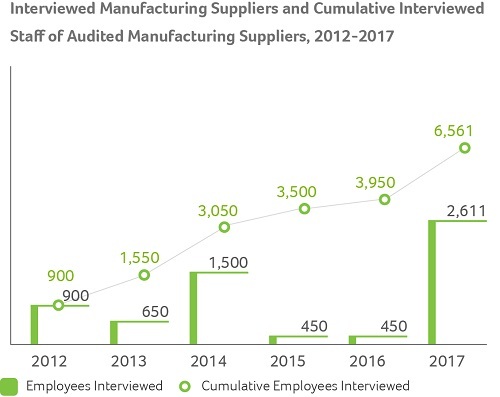 In 2017, a total of over 150,000 direct employees of suppliers were audited, with over 2,611 interviewed and over 70% implementing the RBA VAP. 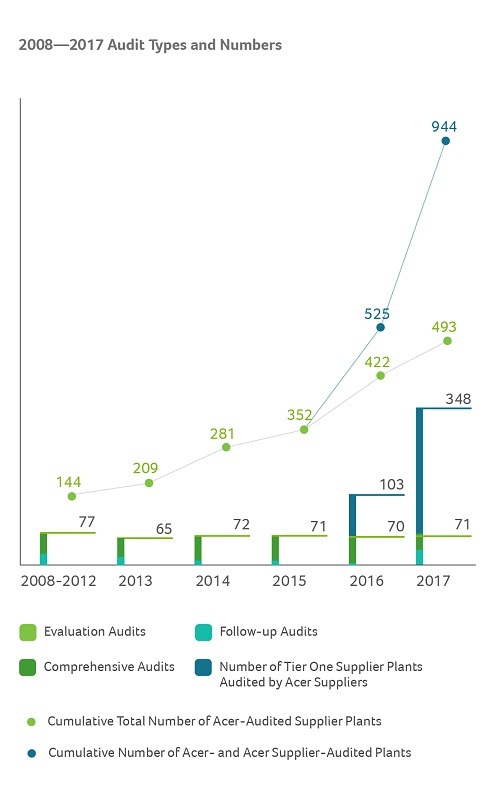 Between 2008 and 2017, a total of 493 supplier audits were carried out. Acer tier one suppliers undertook a total of 348 audits of high-risk suppliers, with results showing that high risks accounted for 16% and medium or low risk the remaining 842%. Target of 2018：70 on-site audits; 1500 workers interview; 150 thousand of workers subjected to on-site audits. From audit results, we see that the greatest proportion of non-conformance occurred in labor issues followed (in order) by health & safety, management systems, environmental issues, and ethics. 2018 Compliance target of on-site audit: Labor 85%; Health & Safety 85%; Environmental 90%; Ethics 95%; Management System 90%. In the event of the discovery of concerns about child labor, falsified records, issues of discrimination, a higher number of priority non-conformance issues, or low audit scores, suppliers will be listed as potential subjects of unannounced audits. Suppliers are informed of upcoming unannounced audits 12 hours prior to audits taking place and are not informed of the content of said audits. In 2017, two suppliers with low audit scores and higher risks the previous year were subjected to unannounced audits. More stringent requirements were imposed on their practices in order to strengthen their social and environmental responsibility management. Acer issues reports on corrective actions required after audits, and suppliers are required to submit Corrective Action Reports (CAR) in response to any issues of non-compliance identified in audits within 30 days of receipt of Acer’s notification. These CARs are to be approved in writing by management personnel and verified against the on-site audit the following year. With regard to high-risk suppliers, as found in the audits, Acer will make the necessary adjustments to our purchasing strategy to manage the issue(s).We will continually to collaborate with the suppliers to improve and conduct the preventative actions. Regarding working hours, the primary lapses were in excessive overtime and insufficient vacation days. We continue to actively manage overtime and vacation day figures for our assembly suppliers. To this end, we have undertaken bimonthly tracking and monitoring, and should any deviations for the targets be found, we require the supplier affected to promptly implement effective solutions. We have also put in place a new Supplier Working Hours Policy in order to reduce overwork in our supply chain and boost the health and morale of workers. With regard to lapses in terms of wages and benefits, the primary source is disciplinary deductions from wages, and after communications with the affected suppliers, measures have been put in place to address the issue. The primary lapses regarding environmental health and safety were in issues around the management of chemical substances and emergency response, with a small number involving personal protective equipment not actually being worn. Lapses involving management of chemical substances involved improper classification, storage, transportation, or disposal of hazardous substances. We require suppliers to comply with regulatory requirements, including correctly labeling hazardous substances on site, as well as setting out/following standard operating procedures and calculating the capacity of spillage protection measures in order to prevent leakage. In addition, to further protect the health and safety of workers, in 2017 we published a list of banned or restricted chemical substances. Lapses involving emergency responses primarily involved failures to properly maintain emergency exits and access ways. Following on-site audits, the suppliers affected put in place corrective measures to improve the situation. Acer offers information and training regarding the latest trends and developments in social and environmental responsibility, thus helping improve their ability to confront the challenge of sustainable development. We continue to invite suppliers to participate in annual supplier CSR communication meetings, CDP project briefings, and major training programs on social and environmental responsibility. This helps them get access to the latest information on global trends, while also presenting opportunities for suppliers to engage in multidirectional communication with Acer senior management or relevant industry experts. In 2017, we focused on environmental responsibility issues such as the setting of carbon reduction targets and the sustainable management of resources. Every year, Acer invites representatives of our major suppliers to participate in annual CSR Communication Meetings, sharing the latest global trends in corporate sustainability and emphasizing Acer’s requirements of and goals for supply chain CSR management performance. In 2017, the meeting was held through an online real-time meeting service, reducing the need for suppliers to physically travel and thus also reducing travel-related carbon emissions. The meeting focused on the performance of Acer's supply chain in terms of social and environmental responsibility and our expectations of suppliers. “Science-based targets” (SBT) see industries and individual companies use scientific methods to set reasonable emissions and carbon reduction targets based on total carbon emissions within a global temperature increase of 2°C and the Global Carbon Budget. Acer not only shoulders our own responsibility to take part in global carbon reduction but has also required our major suppliers define SBTs by the end of 2018 in line with international requirements to find paths to carbon reduction. In addition to inviting a consultant from the Industrial Technology Research Institute (ITRI) to give a talk on SBTs at our 2016 Supplier CSR Communication Meeting, in December 2017 we also invited an expert on carbon reduction from the ITRI to conduct a workshop on SBT carbon reduction target setting and the use of related tools for suppliers, further demonstrating our commitment to low-carbon, sustainable development throughout our supply chain. Since 2008, Acer has been a consistent supporter and promoter of the Carbon Disclosure Project (CDP) in Taiwan. In addition to continuing to promote the annual spring and autumn presentations by the CDP, in 2017 outstanding companies from around Taiwan to share their experience with supply chain management and help the Taiwan industry seize the opportunities that come with climate risk and carbon reduction. “Ensuring sustainable consumption and production patterns” is one of the United Nations’ Sustainable Development Goals, and in early 2017, Acer and National Taiwan University worked together to hold the Sustainable Resource Management Conference, inviting members of the academic and business worlds, along with Acer’s own supply chain, to jointly discuss ability to respond to resource sustainability issues and the opportunities they present. 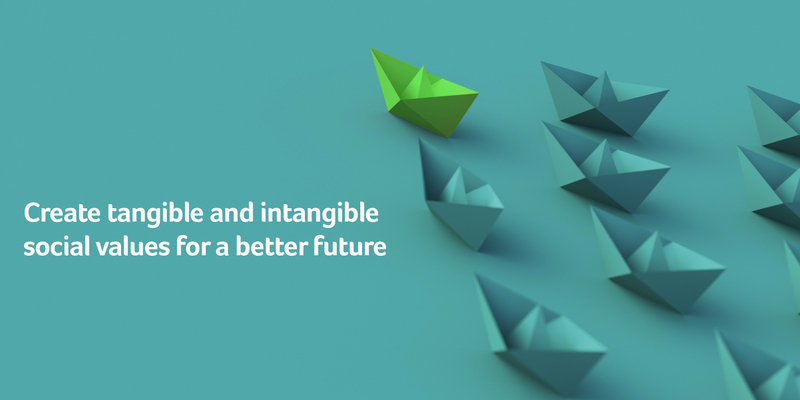 Through linking academia and industry, we seek opportunities in sustainable development, strive to deepen the sustainable management of resources in the industrial world, and help our supply chain respond to international sustainability issues.